knowledge of products and materials, and vision. Homes offer us a refuge from the world. When our interior spaces are bright, functional and aesthetically pleasing, we look forward to spending time there ourselves and with others. Many homes today feature spaces that do not look and function the way we would like them to. Design Transformations helps clients solve puzzling remodeling challenges. I offer innovative design solutions that improve the look and feel of your home, making it into a space you truly desire to be in. 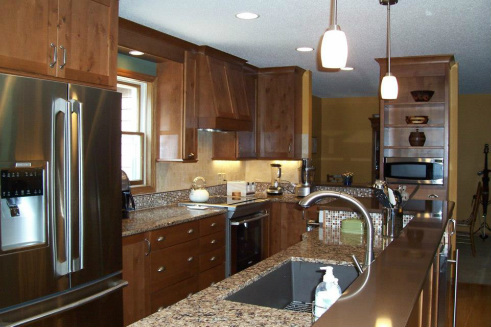 My personalized remodeling plans offer you a range of high-quality products to achieve your design dreams within your budget guidelines. With attention to detail, a strong color sense, and project management experience, I ensure your project receives the care and guidance it deserves. With my ability to visualize end results and experience in construction partnering, I smooth out any bumps in your interior design journey. I work very well with all types of project partners – contractors, suppliers, and skilled tradespeople – to guarantee each step of your project is completed accurately and on time. I offer a free one-hour consultation on all large design projects. I look forward to learning about your interior decorating and remodeling ideas, and am confident we can work together to achieve your vision.